The wine bottle closures are an essential wine accessory as they help to preserve the leftover wine from get-togethers the previous evening. They are much required as it is very tough to put back the original cork back into the bottleneck. The wine stoppers vary in materials, shapes and sizes. They are mostly made of three materials, cork, rubber and even plastic today. The top may vary in material and exquisite designs that please the eye. But the bottom is designed to please the palate. Cork oak is grown in most places. Southern Europe; Spain, Portugal, France & Italy is the centre of the world’s cork oak forest nowadays, accounting for 67% of the total cork-oak production. The remaining 33% has been focused on North Africa. Oak surfaces 2.2 million hectares (5.434 million acres!) of the total land area on the planet, out of which 56% is represented by Spain and Portugal alone. The sponge-like material obtained from cork oak trees is used for the production of cork, known as Quercus Suber. These trees are mainly grown in Portugal. In the late 1600’s when the wine bottles became uniform in design and shape, the cork started to become the popular sealing material of choice. The corkscrew followed a century later, for the wine lover or tavern owner, in the late 1700’s. While they worked well, it was not possible to remove glass stoppers without breaking the wine bottle at the time. So cork replaced glass wine stoppers. From the 1700s onward, the wine had the ability to age and progress in the bottle. The merging of the cork and wine bottle steered fine wine into the modern age. Now cork and fine wine had an aged old relationship. As air oxidizes the wine, a minimal amount of air passing into the bottle is desirable as it also keeps out unwanted aromas. More than 15,000 workers are employed by the cork production industry in factories and commercial departments! More so, the industry has additional 10,000 seasonal workers for the harvest of cork harvest to look after the oak forests. The sale of cork and cork products by producers exceeds $1.5 Billion U.S. Dollars annually to the United States and European market. The cork stopper shares $1.1 Billion U.S. Dollars in this value, while the agglomerated cork sales, flooring, and other related products are $400 million U.S. Dollars. Each year the best corks allow the desired 1 milligram of oxygen to enter into the closed bottle. This is just the perfect quantity of air that allows eliminating the sulfites added during the bottling procedure. It aids in keeping the wine fresh and lower the harmful effects of oxidation. The amount of air is perfect to help the age-worthy wines soften the tannins. The Oaktree must be at least 25 years old before it may be harvested for cork production. Cork trees are able to be reaped once in every nine years. Whereas grape vines are reaped every year. Wine Closure alternatives around the world! In various wine producing countries alternative closures to cork are being tested. Possibly Australia has comprised screwcaps more than any other nation. In the 1970’s aluminium screw caps were preferred to lid wine bottles in New Zealand and Australia. Chateau Margaux has favoured experimenting with screwcaps, in Bordeaux for Pavillon Rouge since 2002. The seal screwcaps is a metallic cap with a liner inside the top of the cap. The inside liner helps to prevent the capability of air to enter into the bottle. The spongy composition of cork allows only a slight exchange of oxygen enabling wines to age, evolve and only improve with the extended age of the bottle. Today; manufactures of screwcaps have taken inspiration from the cork in their construction to permit the desirable limited amounts of air into the bottle. Not all screwcaps enclosures are applied correctly and permit wine to experience premature oxidation. This happens due to lack of perfect seal. It is a major concern as to how wines would age with screwcaps. As they were first presented, Synthetic corks generated from plastic have made an enormous expansion. Initially, the synthetic corks were often deep purple and white. They looked more like rubber. But today they have been designed to look exactly like natural corks. The problems the synthetic corks face is that they are not able to provide a perfect seal. They allow more than the wanted air into the bottle. This only causes the wine to oxidize. To top that, the synthetic corks are known for imparting a slight rubber or chemical smell that damages the wine. A producer of Cabernet Sauvignon, Behrens and Hitchcock in Napa California is one of the early supporters of plastic corks. The plastic corks are preferred by some of the winemakers as they allow air to integrate at a faster pace than normal corks. In fact, it has become part of the selling point as the corks can be ordered to allow for a more or less desired rapid transmission of air into the wine, based on the tightness of seal. Indianshelf offers a great variety of wine bottle stoppers that come in enchanting jute enwrapping. The rubber base comes in exotic looking stylish tops in various materials and designs and etched impressions. The glass and metallic range are simply breathtaking. The golden mercury sunflower design stands out with its well-defined petals and play of golden see through and reflective hues. The Water Paneled Sides Glass wine stoppers are a see-through variety with independent textured elements within the material. Clear Wheel Glass and Metal Wine Stopper stands out with the play of contrasting texture of the etched metal wheel and scratched surface glass bulging from within it. 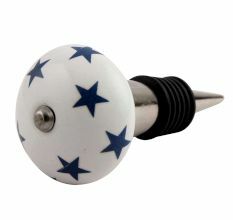 The Navy Blue glass wine stopper features a mosaic-like design that upholds the blue glass dome-structure in the centre. Then there is the prism-shaped variety of hues in smoke and clear glass and a different presentation of milky white variety. The Water Interior cut glass variety in etched pattern overlays simply fascinates the eye. The melon glass comes in interesting hues and modern printed patterns. The old-fashioned etched Ceramic tops in ethnic patterns and colours offer a mindboggling range that you simply cannot say no to. The Japanese, Turkish, French, Italian design representations are besotting and what’s more! They come in the reasonable range starting at Rs.160 to Rs.250. A real steal!